The biggest dilemma that people face when they buy a new iPhone is how to transfer data from the Android or old iPhone. Well, transferring images, audio, videos etc. is easy as there are lots of apps available that allow doing so. Aside from this, it is also important that they can transfer messages and contacts to their new phone. But the process on how to transfer text messages from Android to iPhone can get little tricky then transferring other data. But don’t worry, as there are some ways available that allow easy transferring of messages from Android to iPhone. Buying a new iPhone is a lot easier than to set it up. Media files like music, images, and video clips are a lot easier to transfer cross-platform. But the part of migrating contacts and text messages especially gets tricky cross platform due to poor compatibility between Android and iPhone. Though is possible to transfer text messages from android to iPhone, the process can be slower and will need several workarounds than normal. Want to transfer Android data to the new iPhone X/8/7s faster and securely? Then one-click transfer solution - dr.fone - Switch can help in the task. 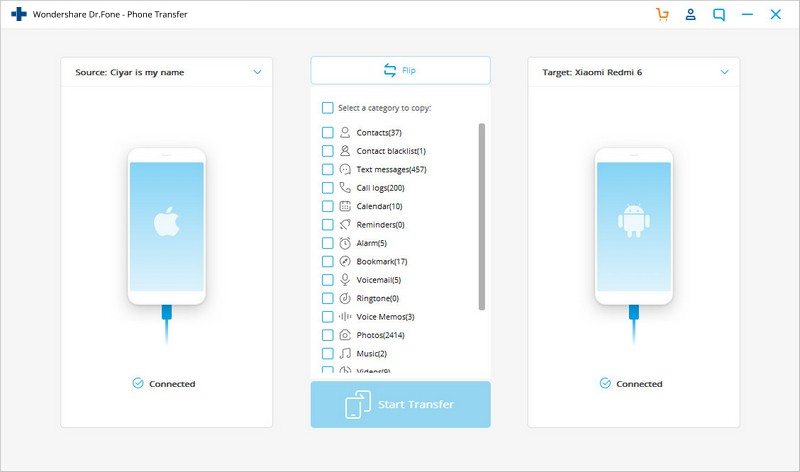 It is a powerful transfer tool that lets user transfer messages from android to iPhone real quick and without any risk. It can transfer not only text messages, but also contacts, music, images, videos, and others. With dr.fone - Switch, one can easily transfer phone data from an android, iOS, Symbian etc. to other Android or iOS device. You don’t need to install any app on the sending and receiving devices. Just connect the devices with a USB cable simultaneously and you can transfer data between then very carefully. Transfer photos, text messages, contacts, notes, and many other file types. Supports over 8000+ Android devices. Works for all models of iPhone, iPad and iPod. How to transfer SMS from Android to iPhone using dr.fone - Switch? Step 1: Download the dr.fone toolkit and install it on the Windows or Mac computer. Launch the toolkit by double-clicking on the desktop shortcut or from the application directory. Step 2: Then connect both the devices i.e. Android and iPhone to the computer with the help of USB cables. Wait for them to be detected by the software. Step 3: Click on the Switch option on the dr.fone utility home screen and it will take you to dr.fone - Switch interface. 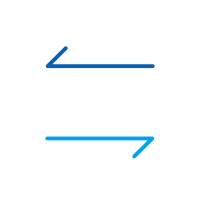 Step 4: Both the Android and iPhone will be displayed on the next screen. Select the Android device as the Source and iPhone as the destination using the Flip button. Step 5: Now, select the data that you want to transfer by checking the respective option. In this case, only check the Text messages checkbox and uncheck everything else. Step 6: Finally hit the “Start Transfer” button and it will begin to transfer text messages from Android to iPhone. dr.fone - Switch offers a safe and quick way to transfer messages from Android to iPhone. Moreover, it can work both on new and old target iPhone. dr.fone -Switch is also compatible with a variety of iOS device and iOS versions, so it doesn’t have any restrictions for transferring data. Transferring text messages from Android to iPhone using dr.fone - Switch is the best and the fastest way. But it requires a computer and physically connecting the devices via USB cables. What if the person doesn’t have a computer? They won’t be able to transfer any data from their old Android to new iPhone. If you want to find another way to transfer messages and other stuff from Android to iPhone, then Move to iOS app can help in this task. How to transfer text messages from Android and iPhone using Move to iOS? Step 1: Click on the “Move data from Android” button on the “Apps and Data” screen during the iPhone setup process. If you have already set up the device, then you need to erase the data from Settings > General > Reset and then go to Apps and Data screen. Step 2: On the iPhone, click “Continue” at the Move from Android screen. It will generate the 6-digit or 10-digit code. Step 3: Now on the Android device, download and install the Move to iOS app and open it. Step 4: Tap on “Continue” and then “Agree” at the terms and conditions screen and then “Next” on the “Find Your Code” screen. Step 5: Enter the code generated on the iPhone in the “Enter Code” screen. Step 6: On the Transfer Data screen, select the content to transfer and click “Next”. It will start the transfer process and will take some time to complete depending on the size of the data. Step 7: After transferring is complete, finish the iPhone device setup process. The disadvantage that this method has is that you can’t transfer messages from Android to iPhone on an already setup iPhone. It only works on a new device or has to erase the data on the target device. Moreover, as it only works with iOS 9/10/11, the older devices can’t transfer messages through this method. They can use dr.fone - Switch for the task. This guide shows you how to setup iPhone as hotspot step by step, so you can share cellular data with other devices around. If you have recently purchased a new tablet and want to know how to transfer photos from Samsung phone to tablet, here are two ways that can help you. Read this guide to know more about the best Android to iPhone contacts transfer app. We have listed the top 5 Android to iPhone contacts transfer software.